Used item. In excellent condition but may have minor marks and show signs of use. This is a Bluthner Model 11 Grand Piano, made in Leipzig Germany and dates from 1967. This beautiful instrument has a light rosewood finish and solid brass fittings. The keyboard is full compass of 88 notes and fitted with two pedals for sustain and quiet playing. Fully regulated and tuned, this is a superb quality instrument for an experienced to professional level player! This particular model is 153cm in length and 147cm wide, therefore delivers a very rich, balanced tone. Famous the world over for their singing 'Golden Tone', Bluthner grand pianos are meticulously handcrafted from only the very finest materials with exceptional attention to detail. 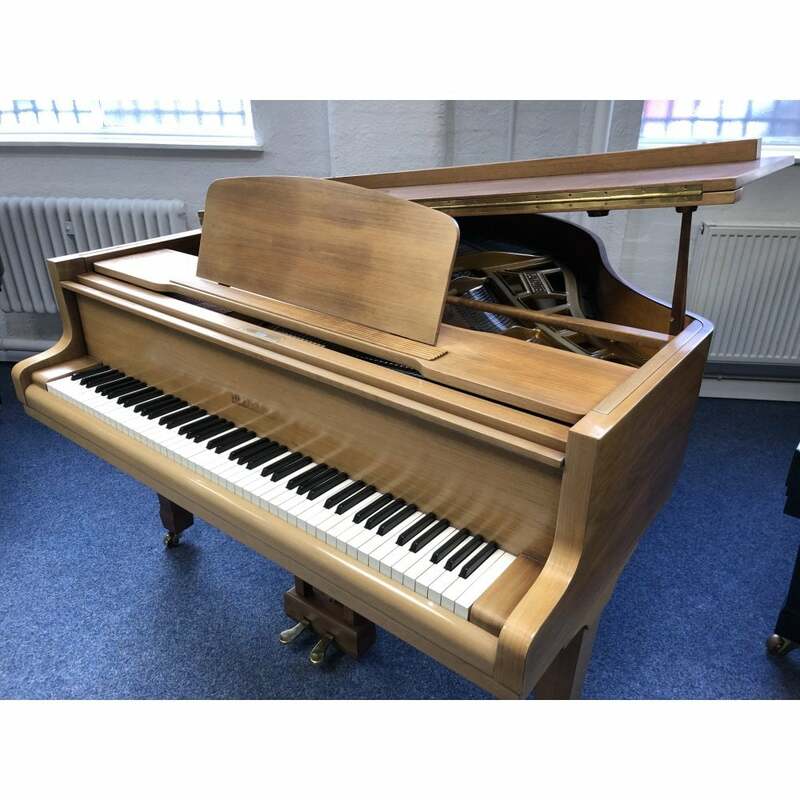 Bluthner takes great pride in being the worlds last remaining 100% family owned and managed piano manufacturer, with each instrument being carefully tested to ensure it is worthy of carrying the family name. At 5'1 in length the Model 11 is the smallest grand piano in the lineup, yet with a cleverly designed wide-tail frame design and soundboard configuration to give the impression of being a much larger instrument. Only specially selected materials are used to construct the Model 11, including red beech for the back frame and rim, along with Austrian Alpine Spruce for the soundboard. A Renner action with Abel hammers has been chosen to complete the instrument, resulting in a warm, singing tone and a well balanced and responsive touch. If it is space that prevents you from putting a grand piano in your home, this instrument may be ideal. It will certainly fit into the smallest corner and you will enjoy all the advantages a grand has to offer: the satisfying touch of the keyboard, the elegance of design that will compliment your home, and a sound that will enchant you. By using the same principles of construction that are applied to the larger instruments, this model leaves nothing to be desired with regard to its tonal character and dynamic range. Even its smaller size does not impede its warm bass and rich treble. For its size, it is certainly one of the best available.